The sky was a bit grey and cloudy as I drove up the ramp to the apartment block but the voice answering the phone was warm and sunny. Meeta had arrived and within minutes she appeared, wearing a bright red dress and a wide smile. Of all the incredible contacts, networking, meetings and friendships that I’ve encountered since I started My Custard Pie, this was one of the most exciting. We’d ‘met’ on Twitter and via Meeta’s blog What’s for lunch, Honey? and this exchange led eventually to working together on a two-day Food photography and styling workshop at Atlantis The Palm, Dubai. We’d e-mailed, Tweeted and Skyped, I’d even met her Mum for lunch, but this was the first time in person. There was no hanging around though; on the eve of the workshop we had prop shopping to do. In the craft shop, our eyes scanned reams of fabrics of every hue and pattern to use as backgrounds, table-cloths and improvised napkins. Meeta said she wanted some brighter colours but laughed once she assessed the selection she’d chosen which included a lot of dark blue and green, while I gravitated to muted taupe and beige. Our personal styles were revealed. Developing a personal style, finding your own creativity and staying true to your instincts in photography and styling was a theme that came up a lot over the next couple of days at Atlantis. It’s easy to get caught up by the latest trends or a certain popular look. Finding your own voice takes time, practise and honesty but is ultimately very rewarding. My passion for simple food with good fresh ingredients is what I try to communicate. Adding a lot of props takes me out of my comfort zone; it’s like wearing someone else’s clothes. There’s so much to share about the workshop that it deserves another post, but Meeta started off the sessions by comparing a bad photo with a good photo. They were both taken by her – one over six years ago and one this year. Time, dedication, practise, perseverance, honesty, confidence and a good eye took her from snaps on her blog to professional food photography and styling. There had been a build up of many months of groundwork prior to the workshop and we had a wonderful couple of days in a lovely location – Nasimi – which I will expand on soon. 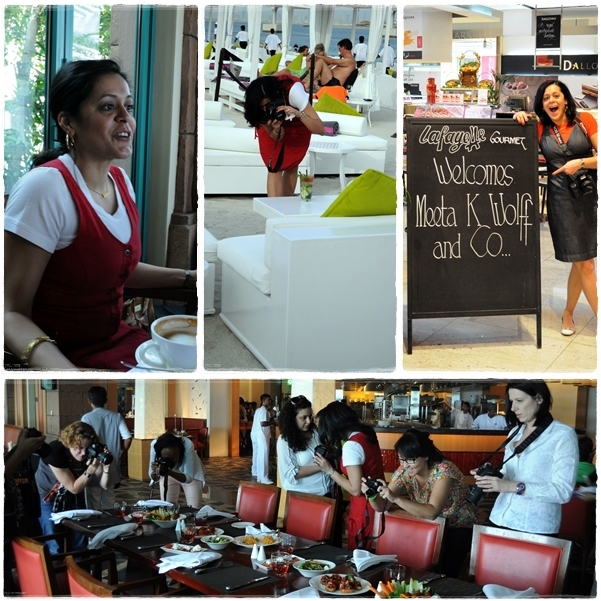 Meeta was as open and sunny as her blog and gave us a lot of food for thought. It was great to get into the kitchen after it was all over for a spot of restful dough bashing. The Fresh From the Oven challenge this month was to make hot cross buns again and a year later I’ve changed how I approached it. For one, I didn’t follow the recipe. Cranberries and orange juice are an irresistible combination in Christmas cranberry sauce; I’ve been a rebel and brought them out for Easter with orange zest and dried cranberries in the dough and a sticky, syrupy glaze of orange juice with a dash a Cointreau. Try them during this Easter week (or at any time). You won’t regret it. I’d love to know what you think of the pictures too – I had a lot of fun experimenting. Which one makes you want to eat these buns the most? Makes 12. Printable version here. For the glaze: Put 100g (4oz) caster sugar in a small saucepan with 50ml fresh orange juice. Heat gently to dissolve sugar then raise the heat and bring to the boil until thickened but not brown. Leave to cool and add 15ml Cointreau. For the crosses: approx 50g (2oz) shortcrust pastry or 1 tablespoon of plain flour mixed to a loose paste with 1 tablespoon of water. Add the yeast/milk mixture and egg to form a soft dough (I use the dough hook). Knead for 10 minutes by machine or hand. Remove the dough, wash and dry the bowl and lightly oil it, then return the dough, cover with cling film and leave in a warm place for about 2 hours or until doubled in size. Knock back the dough (removing the air), lightly knead again for a few minutes then cut it into 12 equal pieces. Roll each piece into a ball (I do this by tucking the edges underneath) and put on a baking sheet lined with baking paper. Cover with cling film and leave to rise again in a warm place for around 30 minutes (alternatively you can put them in the fridge overnight and bring to room temperature in the morning). Roll out the pastry and cut into even strips, brush the back of each strip with a little water and lay two pieces over each bun to form a cross. Alternatively use a piping bag (or plastic bag with the corner cut off) with the flour and water paste to make the crosses. Bake in an oven preheated to 190C (325F) for 15-20 minutes. Make the glaze while they are cooking and brush this over the top while the buns are still warm. Cool on a wire rack. Serve with butter and jam. I think I’ll try soaking the cranberries in Cointreau overnight next time for an extra orangey hit. 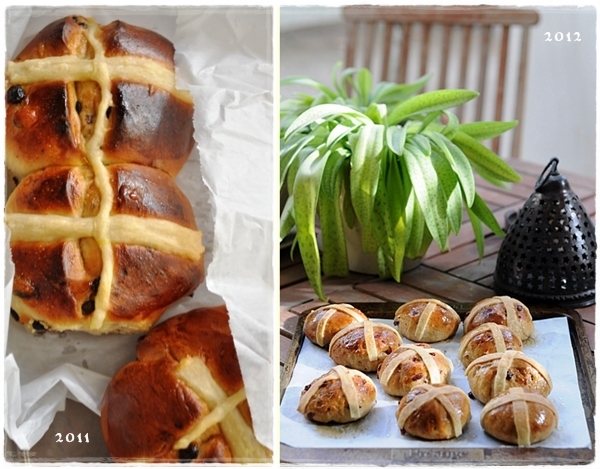 Did you make hot cross buns this year? As always, you can see many more buns over on The Little Loaf , who set the challenge, and the round up on Purely Food . Hi Claire, My email is on the About page but I’ll drop you a line. I am sure Meeta is a lovely person!! 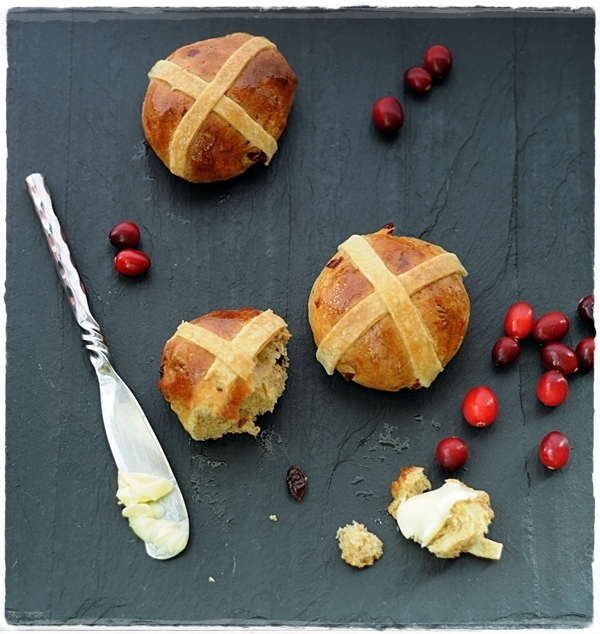 I love all the photos and think the cranberry hot cross buns are sounding yummy! She is – it was great fun. orange and cranberry… mmm deeelish! Thanks Drina – and I really appreciate the feedback on the image. Now you’re talking – could replace the crosses with stars? Oh, I wish I could take part in such a workshop with Meeta. I wish you could too Rosa – maybe next time….because hopefully there will be a next time. Great post, Sally! I’m looking forward to reading more about the workshop. 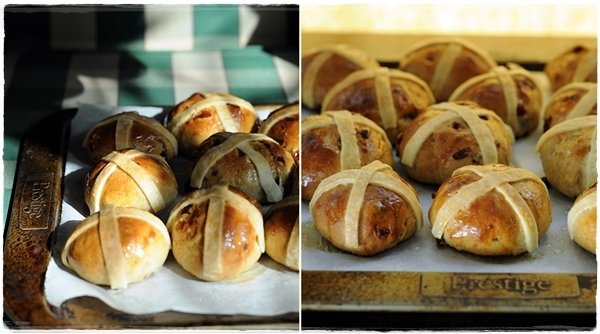 These hot cross buns look awesome! Love the big photo of the buns and cranberries with the grey background. Look forward to hearing more about the workshop! Thanks Amy – that’s 2 votes for that pic. I used slate as a background. Didi and Zizi – Just writing up the workshop post now – thanks for your interest and feedback. Much appreciated. I like that you love any of them! 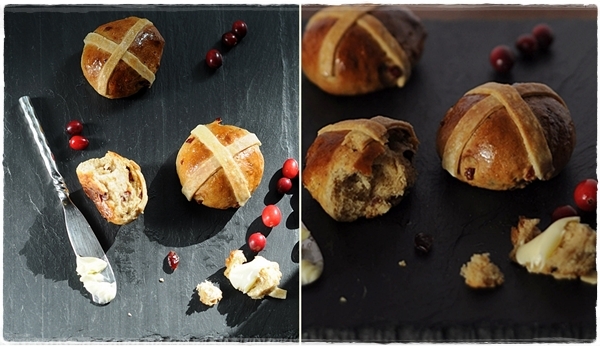 Meeta and delicious hot cross buns, all in one post – perfection. I love the cranberry twist you’ve given the recipe. They sound exceptional. I was really pleased with this twist – I usually like to leave the classics alone but the cranberries have a tang that raisins lack. Thanks Charlie. 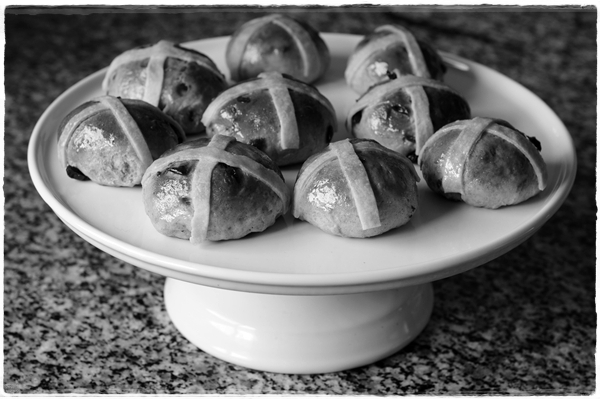 lovely buns Sally…washed down with lashings of tea I trust…. …of course. I run on tea as you know Debi. They look great! 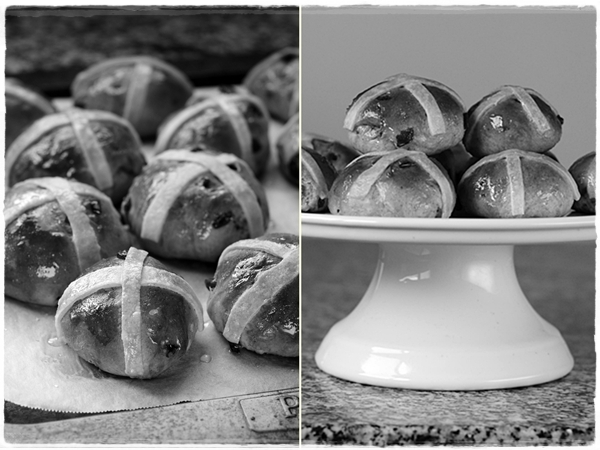 I had hot cross buns for the first time this year after photographing them for a local natural foods store and have fallen in love! Buttery, sticky, delicious! They seem to be available all year round in England now, but they were a special annual treat when I was a child. Yes – butter is essential. Glad you’ve discovered them. What a lovely post! The big one of the buns on a slate was the one that had me reaching to eat them! Thanks Euan – your ‘eye’ is most welcome. Interesting – I’m not a fluffy chick and pastel person so the black slate was a reaction to that. Sounds like I’m not the only one! Thanks for dropping by Dima (and look forward to hearing about your travels). yours look delectable. Mine didn’t look as good but tasted fab. The workshop seems like it was a lot of fun. Good job there, all of you. 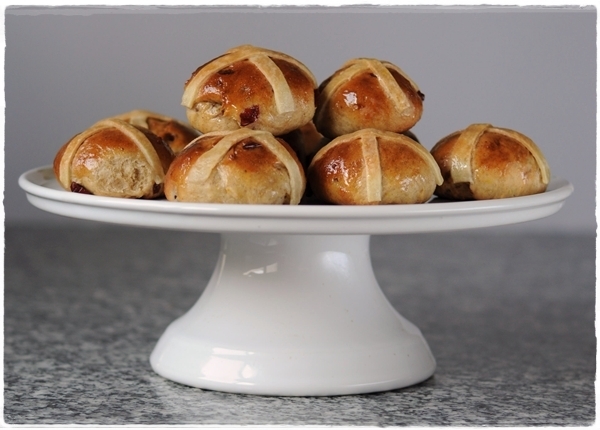 I didn’t make Hot Cross Buns this Easter but I think I might give these a go for this weekend’s treat. Glad that you have a good workshop. Looking forward to hearing more. Love to hear how your buns turn out. Hi, Sally! Fantastic food, pictures and narratives, as always! I admire your work and enjoy your blog, and I’ve nominated you for the Versatile Blogger award. Really appreciate the honour Assia and fascinated by the answers you gave on your blog. Nothing personal, but I’ve decided not to participate in these awards anymore. Your kind words and the sentiments are really treasured though. Thank you for taking part. Your variation sounds delicious and your photos are beautiful. 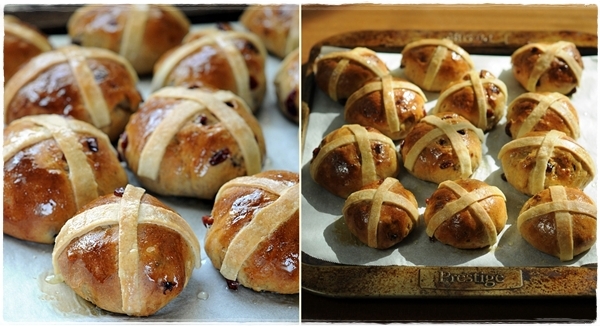 I get very annoyed if I ever miss a FFTO challenge – might not have made hot cross buns this year if not prompted and I’m so glad I did. Oh how I wish there was a workshop like that around here – I have recently got a “real” camera from my hubby and most recently a macro lens for food photography – I am still very green when it comes to taking photos but I am super eager to learn. Fantastic recipe! Sadly I never made any this year – Easter arrived way before I was ready.